When credit is due, I must try harder to give it freely! And so it is with Gertrud Franck. Thankyou. I’m going to try to do a short review on her work, and try to do it justice! Have you read a review of any 1980’s books recently?? 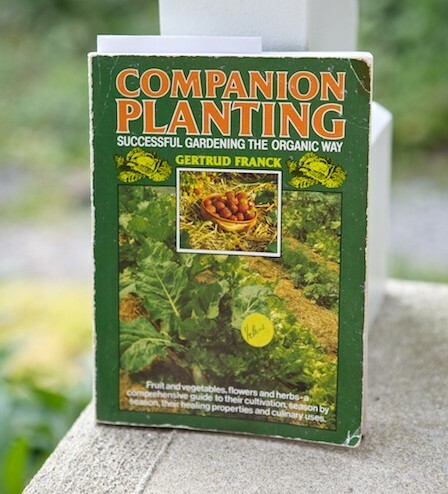 Companion Planting – Successful gardening the organic way. Respect to any gardening book that looks this worn out! My kind of farmer! From there the title says it all – and more than you think. Have you ever read an article on companion planting reduced down to “..carrots love tomatoes..” or “..tomato loves basil..”? It’s not that kind of book! Without as much ado as this reviews introduction she capably outlines her generations worth of work creating herself as companion to her garden. She eventually earnt a mastery of not reducing but expanding the context of simple plant relationships in a vege garden. How do we know it worked? Her garden got more fertile every year, she only had to deal with insects that came from outside her system, and never had any true weed issues. She almost never bought in anything called fertiliser! Crop rotations are redundant! Insects are celebrated! I have a sneaking suspicion her family was very healthy too. This very large departure from simple two-value relationship statements is profound to. Before she gets to explaining how her garden works, she takes us on a concise walk-through of the gardening year, from the perspective that the dinner table demands, and our seasonal social life obliges, and our community involvements, all eventually determine our attitude to organic gardening. How does Gertuds garden grow?? 1. Big gross feeders, trellis crops. 3. smaller, short season and low stature plants. Consider the physical architecture of the vegetable plants in those groups. She’s given them space and light and air, and shelter, warmth, and so moisture and life! As if it stopped there! Mrs Gertrud Franck then, decides to spend a few chapters integrating fruit trees into this mix, and follows with a chapter on managing animals, weeds, flowers and shrubs. Once that is done, she covers nutrition in vegetables, and medicinal herbs, recycling and composting, and so on. I get the impression she’d have attempted to create a pattern for healthy human beings in this book if let leave to. I’d have read it too! In all this her writing style is as curt and economical as you’d expect of a german, agriculturalist, home-maker, philosopher, research scientist, hoe-swinging, chook-gutting, lady. I’ve grown to her methods, and will again, why? They were the best fruits for the least effort and the most fun and wonder of any crops I ever grew. I like the ‘wonder’ – this system enables fascination in the natural world, not frustration in our trying to dominate it. Since the first chapter, this book taught me hard truths about taking preconceptions and crappy planning out into the paddock. I dont have thirty years of experience yet to implement Gertruds garden as pretty as I’d like, but from the best vegetables, come the best things in life. Yes I have copies to loan, I could even dig up a scan copy of this book. Any takers? This entry was posted in education, Home-life Skills, Uncategorized and tagged books, holistic health, inspirations, organic garden, organic te, reviews by humble house. Bookmark the permalink. Sure, I’ll get one to you at the next opportunity. It should scale up ok, it is row plantings, managing the planting timetable would seem to me to be the element that requires some skill..
your way of living is a source of inspiration for us. Thank you so much. Recently I created me own vegy garden and starting to pick the first fruits. the first fruits!! great memories hey!